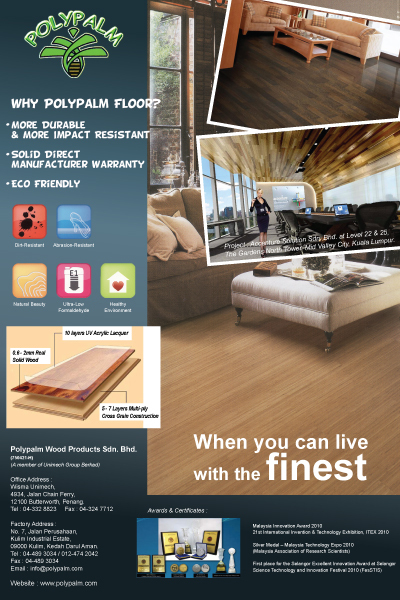 Polypalm Wood Products Sdn Bhd, incorporated in 2006 and a member of Unimech Group Berhad (UGB) was set-up to develop and commercialise the resin impregnated palm materials as a new source of materials, primarily for flooring. Polypalm developed a new generation of green building materials that has the added value in terms of being healthy, environmentally friendly, recyclables, high performing and artfully crafted for a re-interpretation of spatial aesthetics. We present quality products that are conscientious and forward thinking. Polypalm floorings are produced by using branded machines from Germany for meeting the most stringent international production standards. The floorings have been tested by the French Agricultural Research Centre for International Development (CIRAD) and the Forest Research Institute of Malaysia (FRIM). With more than 5 years of extensive research and development efforts and a solid Direct Manufacturer Warranty, Polypalm floor is also affordable, highly durable, versatile and beautiful and has a superior wear and comfort, is green, safe and cost effective. It has a distinctive grain pattern and exceeds the flooring standard requirements and is subject to rigorous testing and meets the standards required for flooring applications.